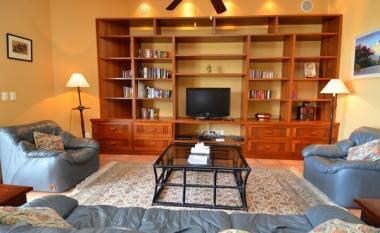 Inquire about costs per person above 8 guests. 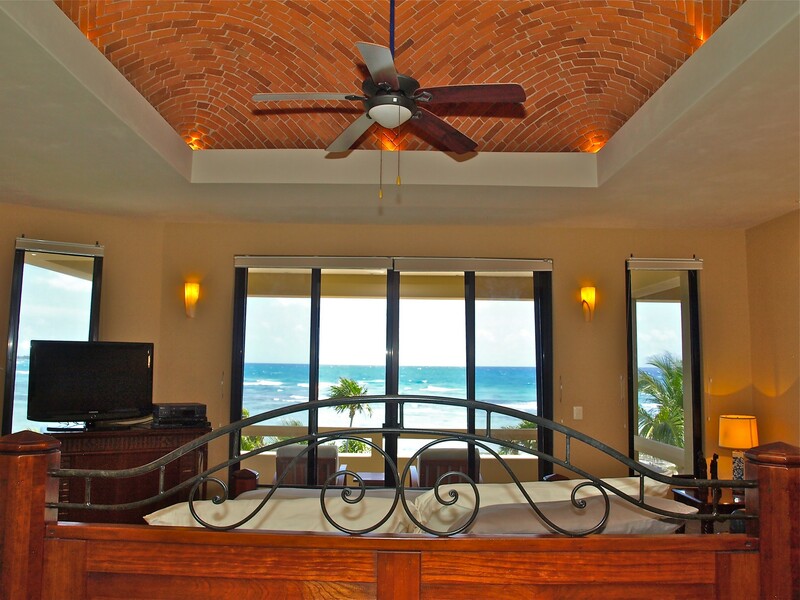 Walk into the ocean and reef from this beachfront 6 BR (4 suites plus studio plus 1 other BR. 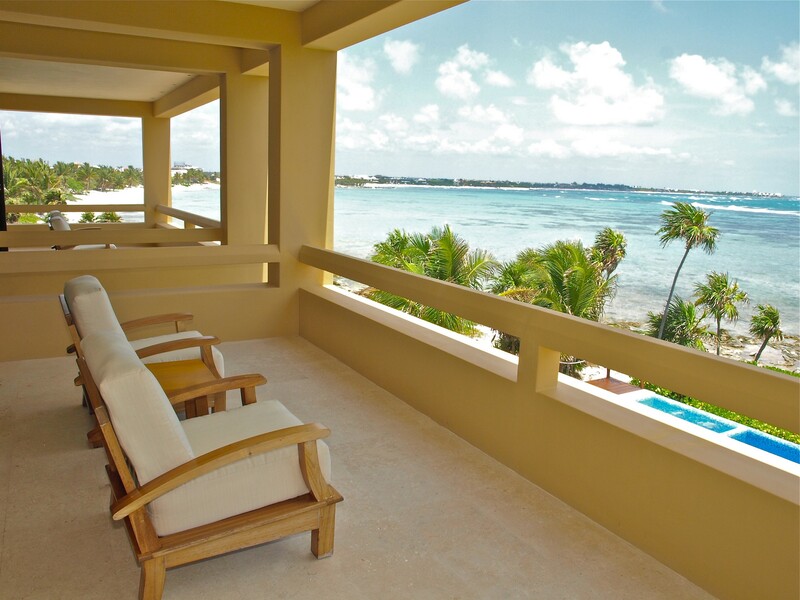 8500 sq feet of beautiful integrated indoor and outdoor living areas offering ocean and sunrise / sunset views from its suites, balconies and rooftop. 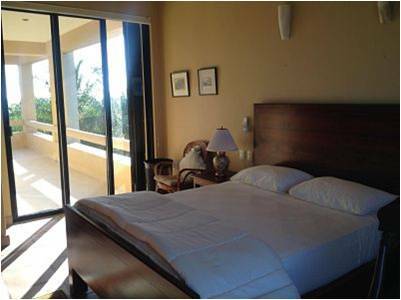 Ocean views and breezes are created in most rooms through large windows and many recessing or sliding doors. 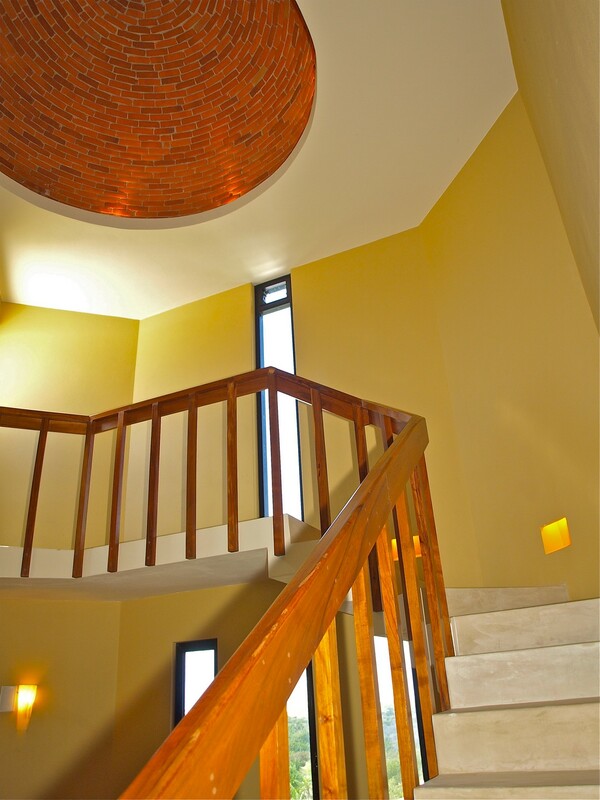 This newly constructed villa was designed by the most cutting edge architect in the area with soaring ceilings. The house is about 2 to 3 times the square footage of most houses in the area. 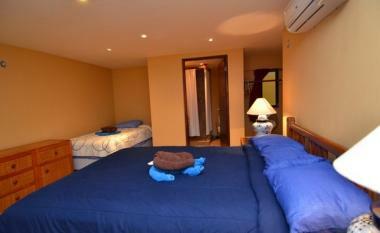 There are 6 air conditioned bedrooms in total. 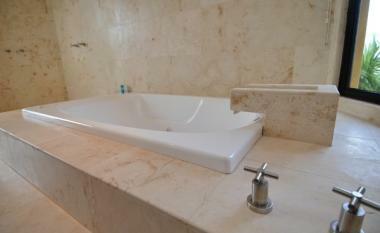 There are 4 suites with full baths. 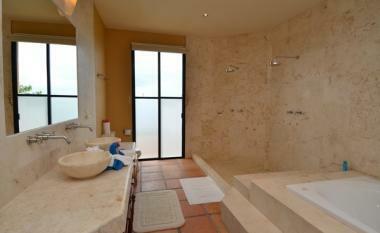 The main master suite is huge with Jacuzzi tub and double showers. 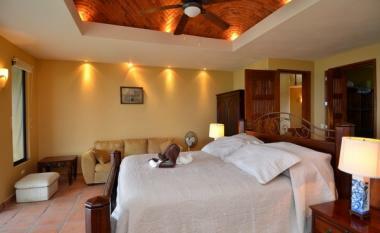 Three of the suites have ocean and jungle (sunrise and sunset) views with access to broad balconies and verandahs. 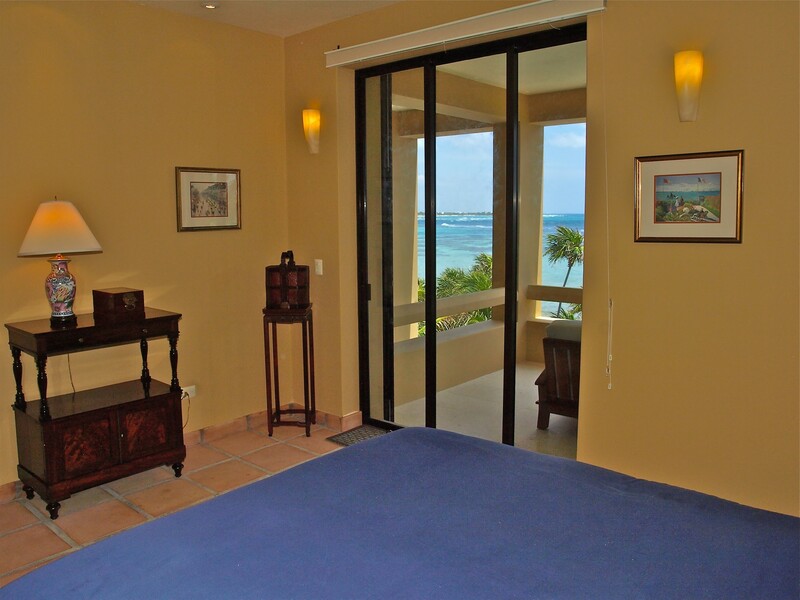 The 4th suite has not have jungle / sunset views but is located on the ocean side with magnificent views and sliding pocket doors onto a large balcony. 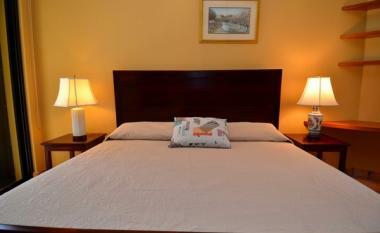 The 4 suites sleep 8 adults easily and 3 have space for additional beds. In addition, on the ground level of the house is an apartment with a full bath that will sleep 3 and another bedroom that will sleep 3 with a toilet and wash basin but no bath. 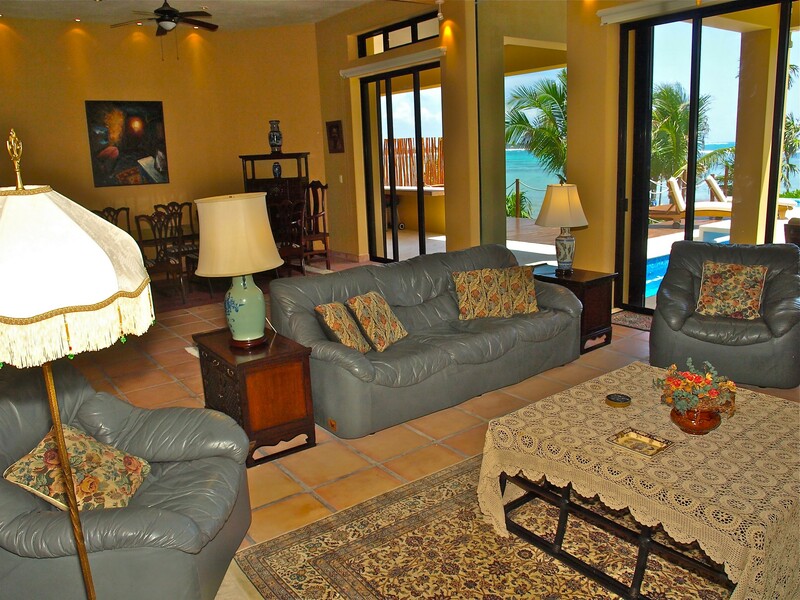 The house is located on the south side of South Akumal bay which has a white sand beach fringed by coconut trees and wide reef. 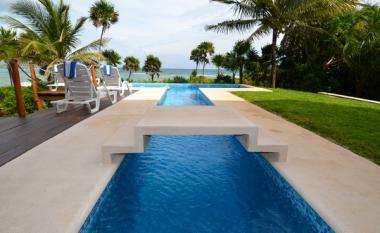 There is a small strip of beach in front of the house next to the water, but the main beach at South Akumal is 100 yards to the north along a sandy track by the water. It is a beautiful, quiet, secluded and usually deserted. 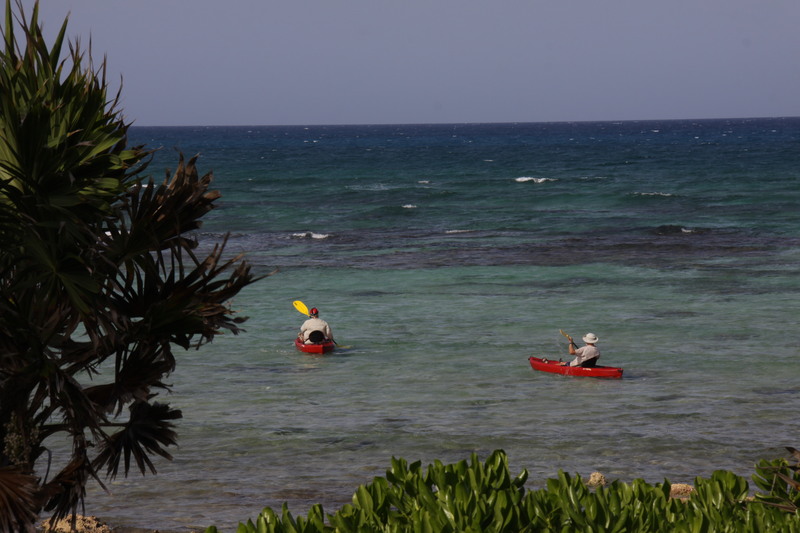 The large beautiful reef is ideal for snorkeling and kayaking. 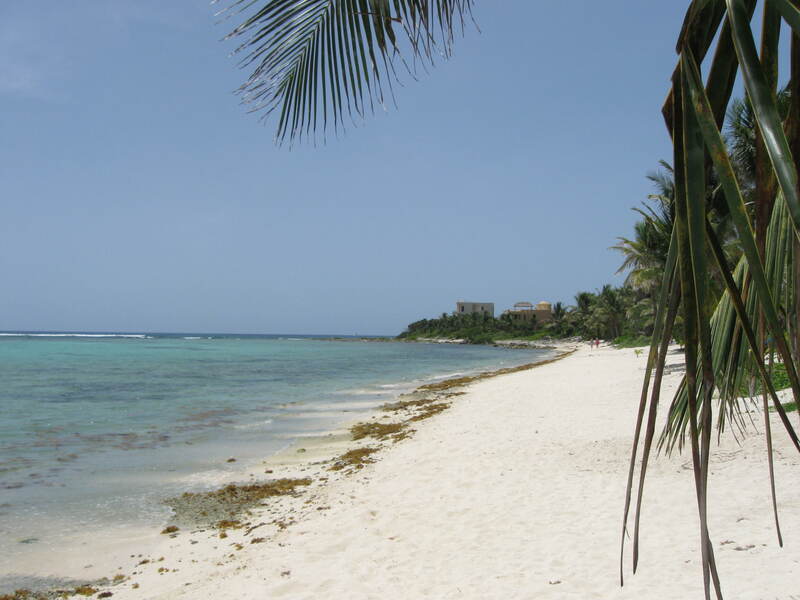 The much busier Akumal beach can be overcrowded and its reef overused. 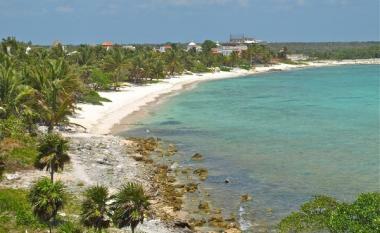 The second long white sand beach - Akumal Aventuras is about 400 yards further south. The water is very close to our house. Just outside our property is a sandy strip then flat rocks which are easy to walk across. You step off these onto a shallow sandy bottom. 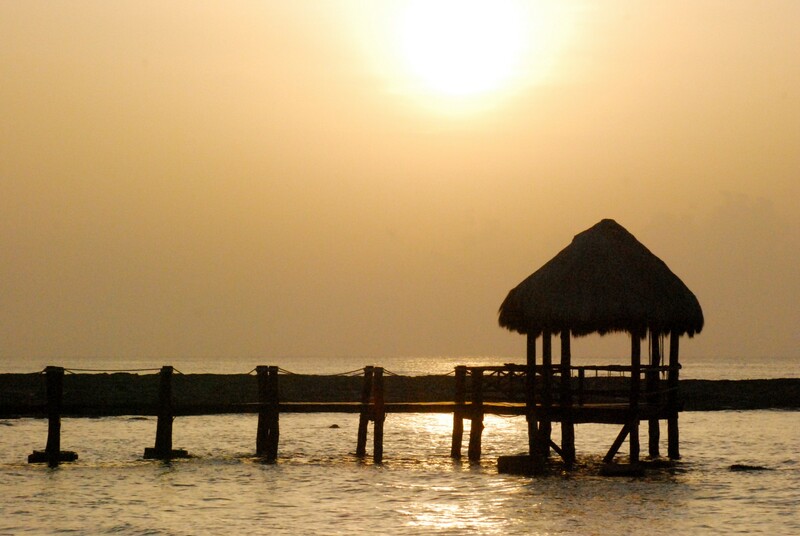 This entrance point to the bay is the closest and best access to the unspoiled reef at South Akumal. It is about 50 yards from this point via a sandy shallow lagoon (2 feet) and protected part of the bay which is also a good area for learners / children. We also launch our kayaks from here. 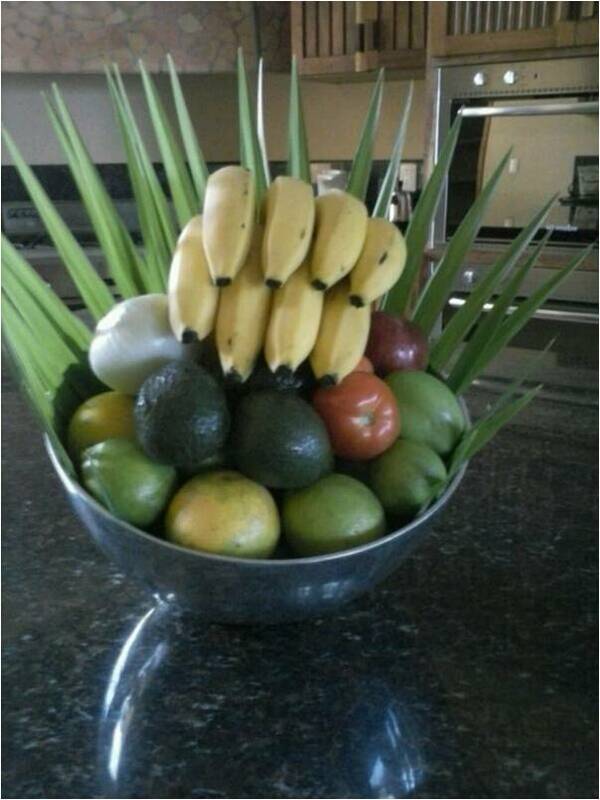 We have a house manager who speaks very good English and will arrange anything for you including chefs and cooks. We also have a maid and handy man who will look after you. Please check out the attached video in this listing. 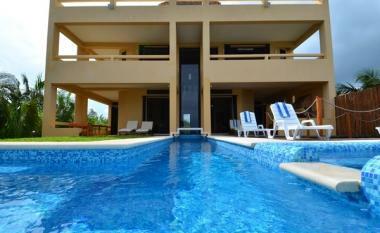 50% return of rental prior to 60 days from stay excluding major holiday periods. 50% up front and final 50% at 60 days prior to check in. 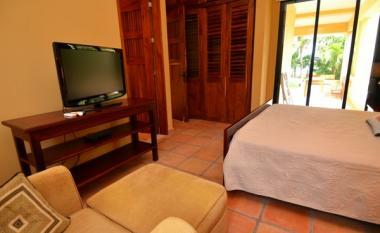 Guest numbers over 8 will incur additional fees. 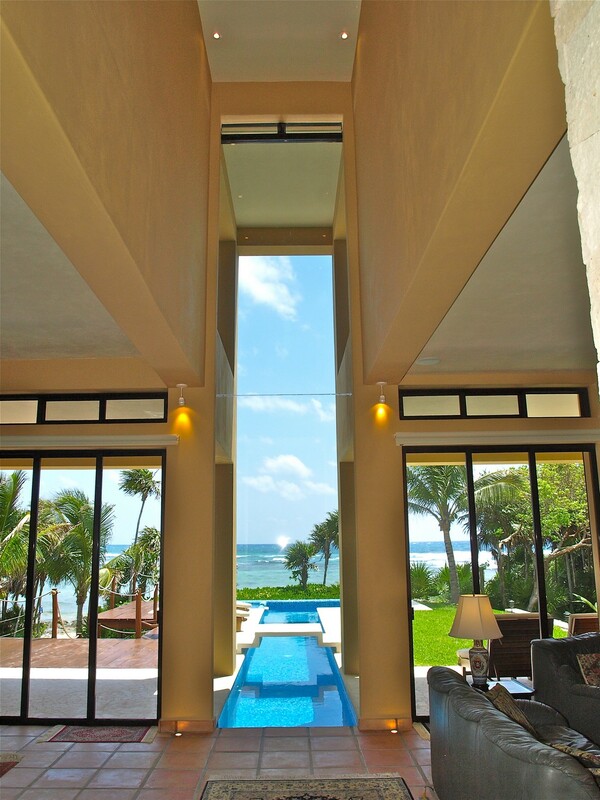 Great home, just as pictured. Very secluded and quaint. The house staff was wonderful, very helpful, very kind and polite. The area was safe, and the provided security staff was very beneficial for questions during the day/night. 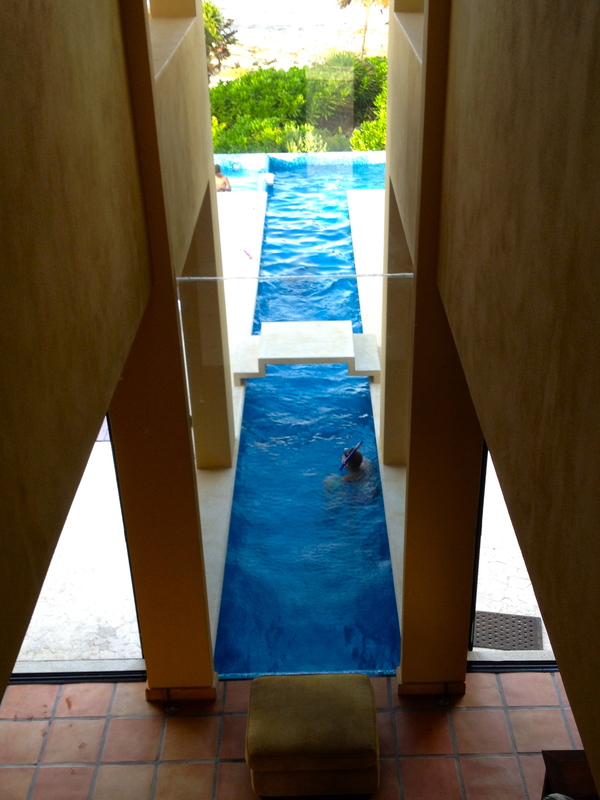 The pool was always flawless, the weather was great and the air conditioning in the rooms was AMAZING. 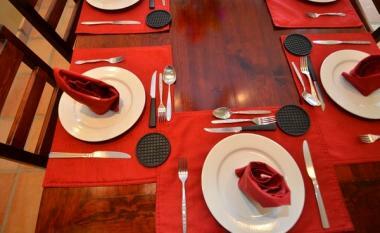 The Kitchen made family dinners great, and the provided charcoal grill allowed for grilling on the pool deck. It was all around a great family vacation. Can't speak highly enough about the house staff, Carlos, Carlos Jr, Maria, and Lucio were wonderful to have around during the week. Thanks Mike and Staff! we were a family of 14 celebrating a big birthday. 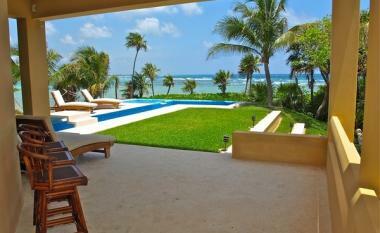 Casa Kukulcan was everything we hoped it would be and more. We ran into a slight inconvenience which Carlos, Maria, and Carlos handled professionally and promptly. The property is magnificent. 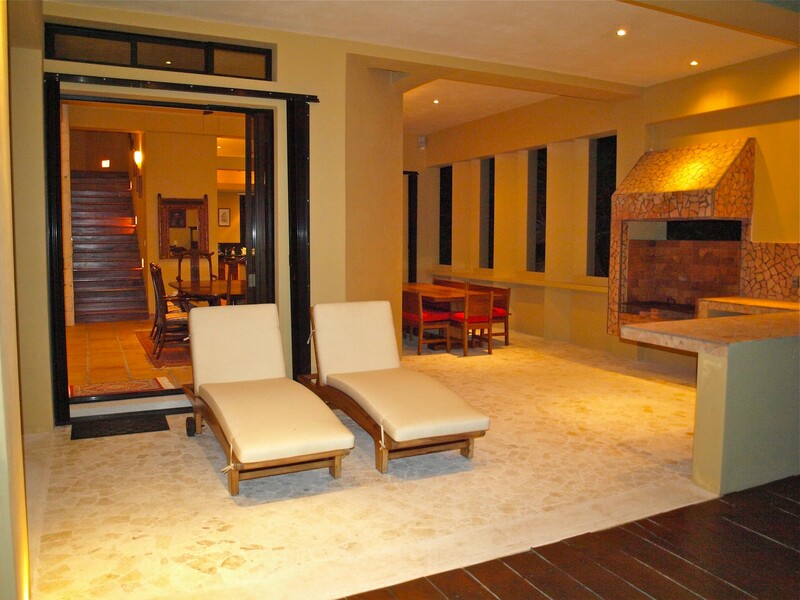 We all loved every minute of our stay at this magnificent villa. Mike McGetrick is a delight to deal with. 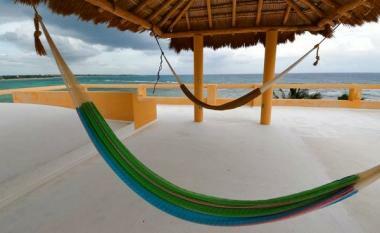 The owner and house manager for Casa Kukulcan were extremely helpful in planning our trip. They both corresponded with us via email months in advance of our trip to help us find a local chef service and select a menu that was perfect for our group. 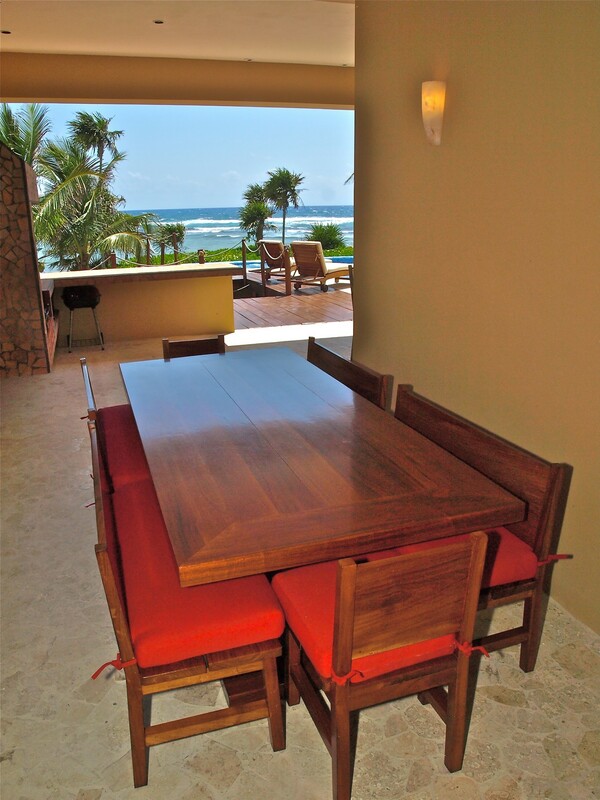 Mealtime in the outdoor dining area was a big highlight of our trip. 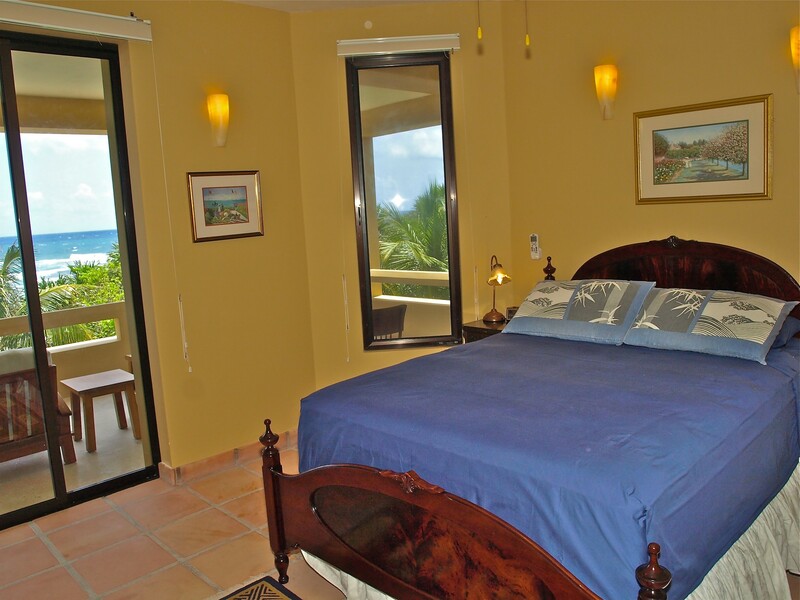 The house has amazing ocean views from every room, and with 4 large suites every couple had access to their own private bathroom and comfortable sleeping arrangements. 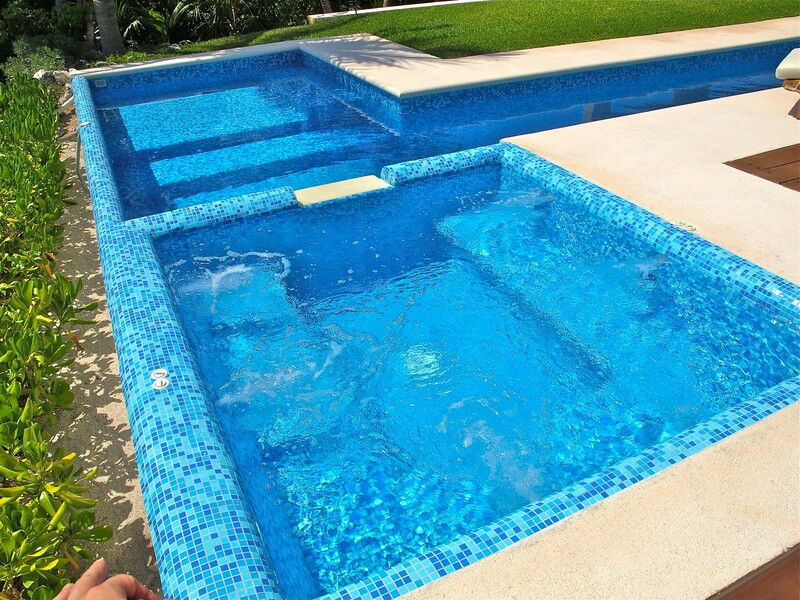 The pool was the perfect size for the elementary-aged children in our family plus there was an extension for adult lap swimming. 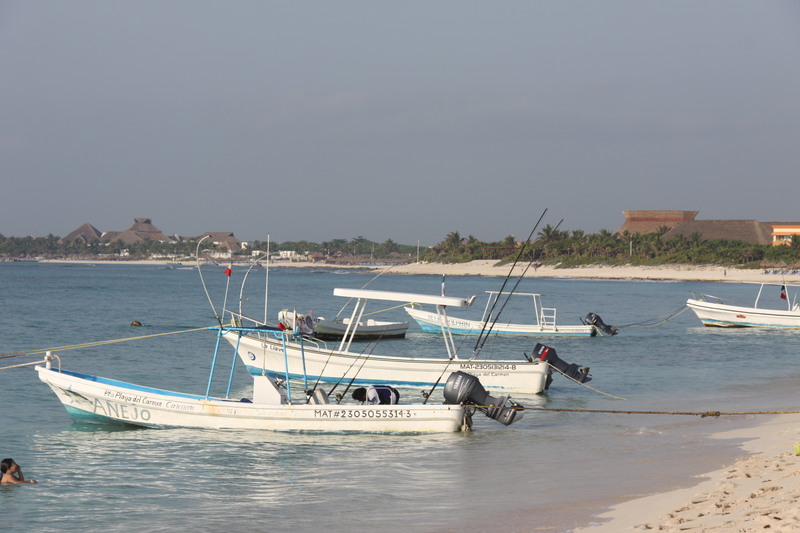 It was a short drive to Akumal where sea turtles were easy to spot and to Tulum to see the ruins. All of the grounds were beautifully maintained. 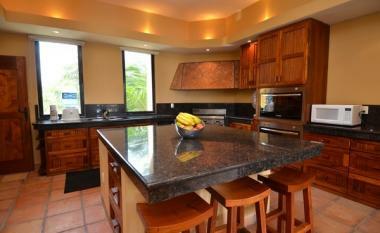 We would recommend this home to anyone looking for a great vacation spot for several families. What an amazing property, location, and staff...best all around trip we've ever had! 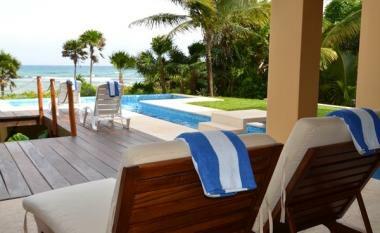 My husband and I enjoyed a perfect honeymoon in a perfect vacation spot thanks to Mike (the owner). 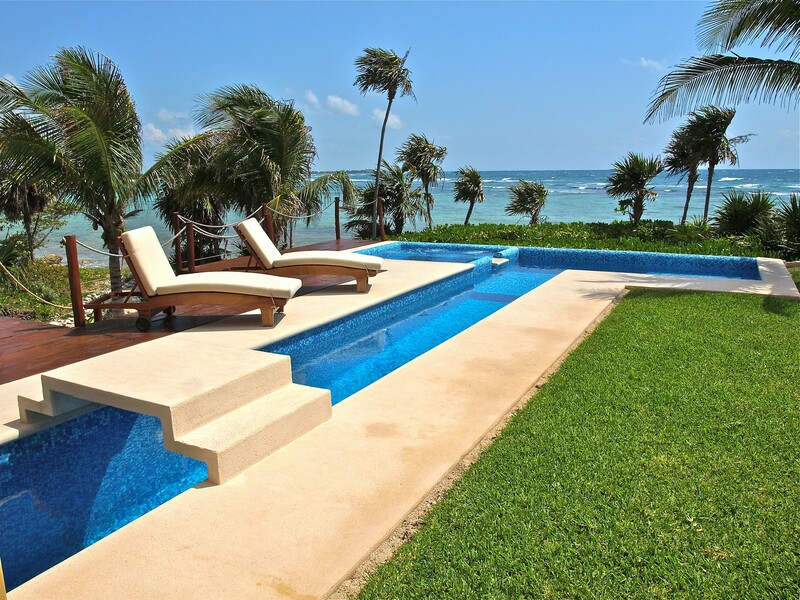 The house and grounds of Casa Kulkulcan are absolutely beautiful and definitely the picture of paradise. 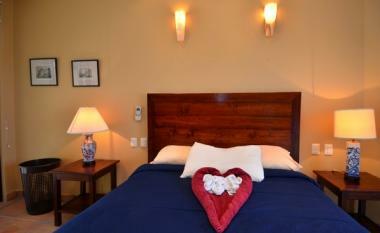 It is spacious, well-maintained, and staffed by excellent people. Our gardener Eduardo was friendly and very helpful. He was there to assist in retrieving any necessary equipment for our trip. He even went above and beyond to help us get a private snorkeling tour of Akumal beach, where we got to see sea turtles, sting rays, and other beautiful parts of the local sea life. The maid Elizabeth and property manager Carlos were also friendly and eager to assist us with anything we might need. Mike was excellent in helping us to prepare and enjoy our vacation as much as possible and Casa Kulkulcan was everything we imagined it would be and more. We highly recommend it to any prospective vacationers! 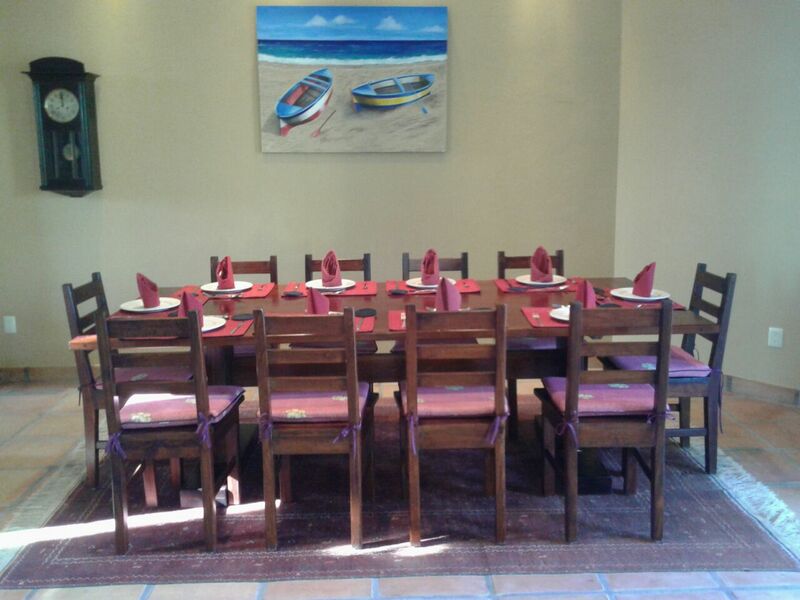 From the moment we decided to book this house, the owner was incredibly helpful and resourceful, providing us with an abundance of information not only relating to the house but to the area and activities we could enjoy throughout our stay. Through several emails and Skype calls he ensured we felt comfortable with where we were staying and fully prepared for the week ahead. The house really is as beautiful (if not more so) as the pictures show and the location is ideal - far enough removed to not be inundated with people/tourists but close enough to still easily access the areas of activity. One of our favourite activities was practically outside our doorstep, which was swimming with the turtles and stingrays in Akumal Beach. Theresa and Jorge were beyond helpful and pleasant to be around! Theresa even helped us to find a chef to cook for us two nights which ended up being the best meals of our trip. 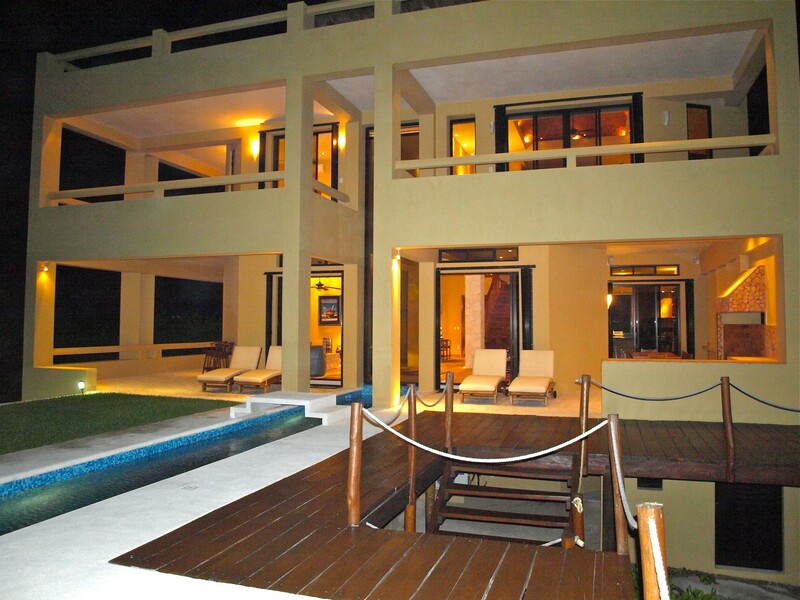 I highly recommend staying here - the place is great and you will be in the best of hands! 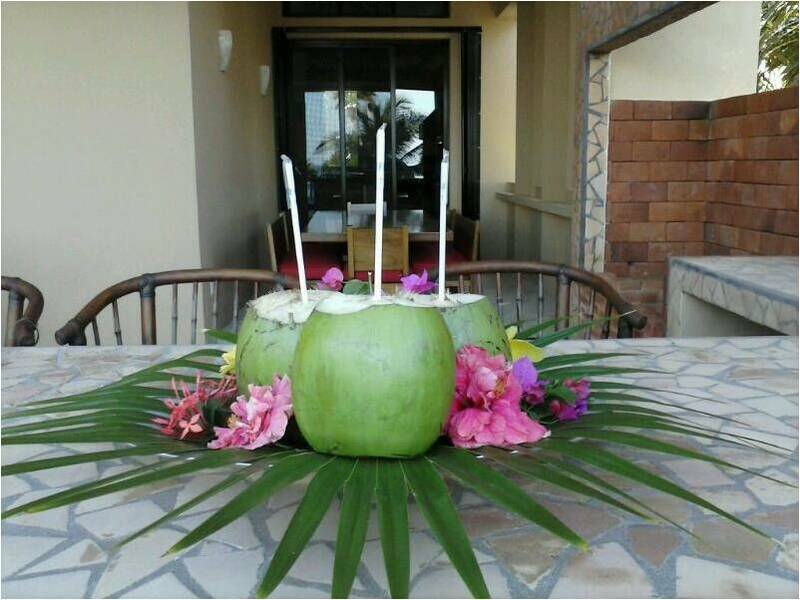 We were two families with older children ( youngest was 17 years), a party of nine people in total, staying here for a week long Christmas vacation in 2013.We had a fantastic time and the property deserves 5 stars. The house is in a beautiful location and very well furnished.We had a few minor inconveniences during our stay which we addressed with the owner / property manager but nothing which in any way detracted from our overall enjoyment of the property.The owner made the rental arrangements very efficiently and he did everything possible to be helpful. 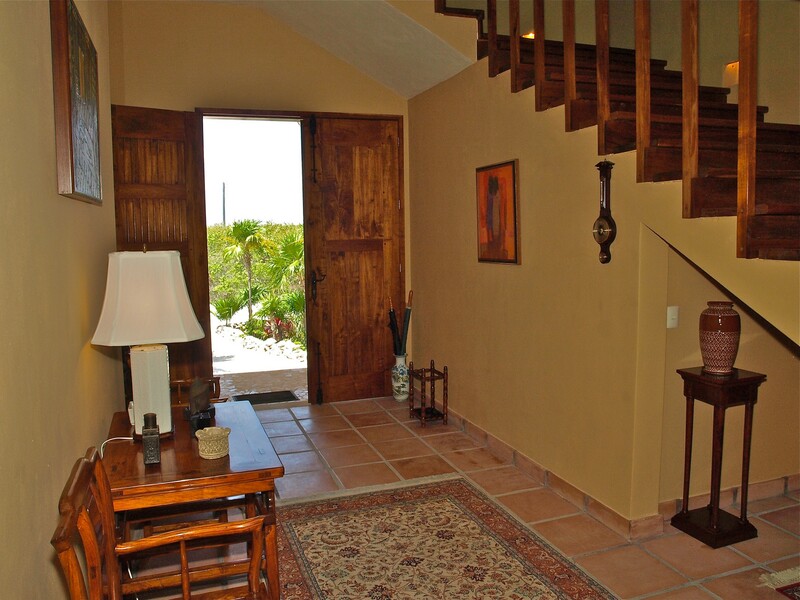 The staff at the property, Jorge and Teresita, who looked after the grounds / pool and did house cleaning during our stay were very helpful and friendly.The property manager, Angel was always available to assist with any issue and introduced us to the house very thoroughly. 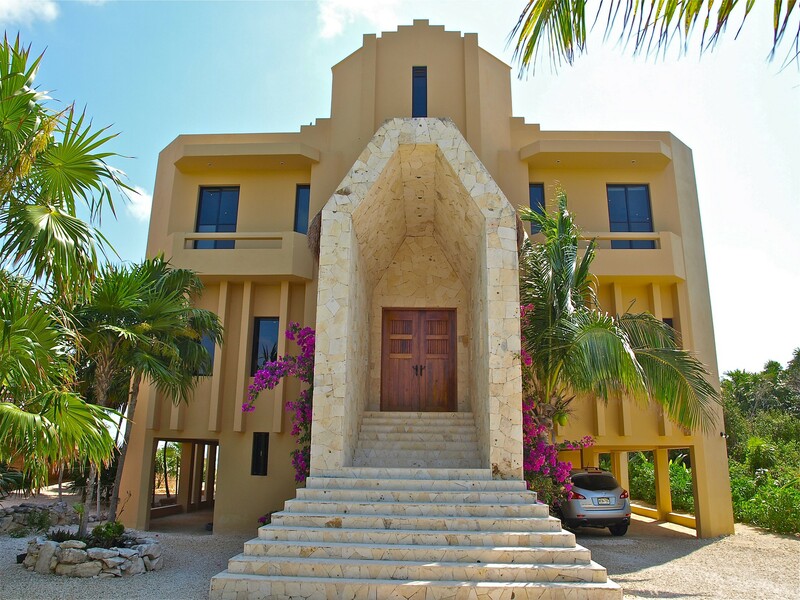 This house is as beautiful in reality as the pictures portray and the location is wonderfully convenient yet very quiet and secure.There is lots to do nearby and we enjoyed the tourist sites such as the ruins of Tulum, ATV trail rides, fishing trips, exploring underground cenotes, lots of beach activities and wonderful snorkeling.For dining we found great restaurants from small and cheap taco stands in Akumal to upscale restaurants in Tulum. I would strongly recommend you rent a car to enable you to fully enjoy this beautiful part of Mexico and its delightful 'winter' climate.